Visit the onboard fine arts exhibit curated by celebrated Los Angeles-based artist Ben Jackel. “USS Indianapolis and other Tales from the Sea.” Jackel will be curating future shows for the space. Official opening November 17, 2018. The centerpiece of this show is a striking, newly completed stoneware sculpture of the doomed World War II heavy cruiser USS Indianapolis, the ship that delivered the atomic bomb “Little Boy” to the Pacific island of Tinian. A Japanese submarine sunk the vessel, but it is most famous for the tragic suffering and loss of her crew. Hundreds lost in shark-infested waters. The sinking of the Indianapolis led to the greatest loss of life from a single vessel at sea in U.S. Naval history. 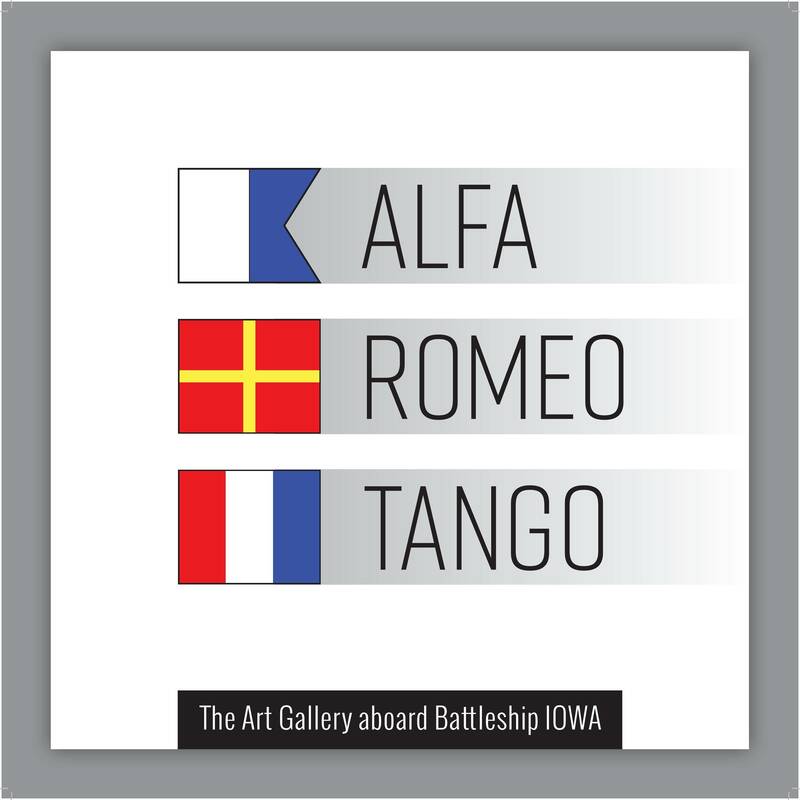 The naming of the new exhibition space, “Alfa Romeo Tango,” is from the National Alliance Treaty Organization (NATO) phonetic alphabet spelling the word “art.” The location is on the third deck, near the semi-permanent show, “Lost at Sea: The Explorations of Dr. Robert Ballard.” General admission to the museum incorporates entry to the gallery. A percentage of each sale will be donated to Battleship IOWA Museum. General Admission to the Battleship IOWA includes the exhibit. The Battleship IOWA Museum ticket office opens daily at 10:00 a.m. and the last tour ticket sold at 4:00 p.m. Tickets purchased at the box office are $19.95 for ages 12 – 61. Youth tickets for ages 3 – 11 are $11.95. Senior admission (62 and over) are $9.95. Children under 3 are free. General admission for the military (active, retired and U.S. armed forces) is $14.95. Born and raised in Aurora, Colorado, Ben Jackel received his BFA from the University of Colorado, Boulder, and earned his MFA at the University of California, Los Angeles. As a graduate student at the onset of the Iraq War, Jackel began to reflect on his lifelong interest in military history by examining weaponry and combat apparatuses to represent the humanity of war. This inquiry led him to create his first life-size Civil War-era cannon from clay and wood in 2002 and continues to manifest in his work today. While working in clay and wood as primary materials, his works symbolize aspects of conflict, warfare or disaster, but belied by their organic or fragile media. L.A. Louver gallery began representing Jackel in 2007, presenting solo exhibitions “Compliance Solutions” (2009), “Zero Percent Contained” (2011), “American Imperium” (2015) and “Reign of Fire” (2017). His works have shown at UCLA Fowler Museum; Williamson Gallery at the Art Center College of Design, Pasadena, CA; Torrance Art Museum, CA; Denver Art Museum, CO; China Central Academy of Fine Arts, Beijing; Venice Biennale, Italy, among others. Jackel was an artist-in-residence at University of Colorado, Boulder. He has held a teaching position at California State University Long Beach and currently instructs at University of California, Los Angeles (UCLA). A comprehensive online catalog that surveys Jackel’s works from 2008-2017, with supplementary videos and descriptions, can be viewed here.